"My judge is a kaffir, my lawyer is a kaffir, my prose[c]utor is a kaffir, and my jury are all kaffirs..."
Rahimi has claimed to be a holy warrior following the path of a jihadist. He sits in a cell in the Metropolitan Correctional Center (MCC) in lower Manhattan awaiting a Feb. 13 sentencing hearing where he could face life in prison. According to the prosecution's sentencing memorandum, Rahimi not only lacks remorse, but has made light of the terrorist attacks. He even boasted of his notoriety, telling his friends and family, "I don't need to watch the news because I am the news." The memorandum goes on to describe him as someone who "was committed to waging his holy war against Americans years before he carried out his attack. Even today, he appears to remain steadfast in that commitment and has shown no remorse." 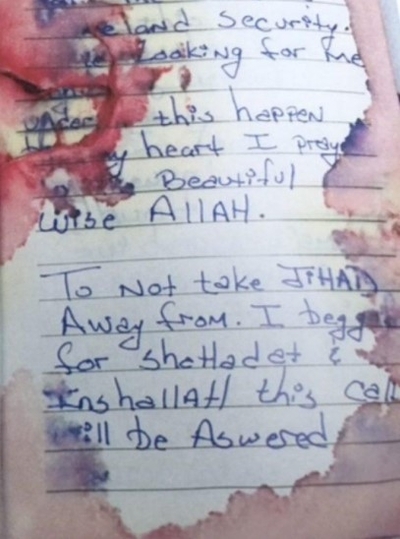 A page from Rahimi's bloody notebook, taken after a shootout with police, shows a committed jihadist. His current confinement has not slowed him down. Quite the opposite. The U.S. Attorney's office recently discovered that Rahimi was radicalizing other inmates in MCC. He shared sermons by the late American-born al-Qaida ideologue Anwar al-Awlaki with his fellow Muslim inmates during Jummah services, along with copies of al-Qaida's Inspire magazine and other jihadist literature which contained instructions for making IEDs. This egregious breakdown in security procedures by BOP staff not only encourages jailed jihadists, but it is the antithesis of the FBI Correctional Intelligence Initiative's stated goal to "detect, deter, and disrupt efforts by terrorist and extremist groups to radicalize or recruit within all federal, state, territorial, tribal and local prison populations." Should we be surprised that a terrorist continues down the path of death and destruction even when faced with life in prison? Is this some new unprecedented phenomena? Not when we consider this warning from another convicted terrorist spoken 25 years ago: "If the devil leaders of New York think placing me in [prison] will end the war, they are wrong; this is only the beginning." Those are the words of El Sayyid Nosair as he was being taken from New York to the Federal Bureau of Prisons' maximum security facility in Florence, Colo. to serve a life sentence for his part in the 1993 bombing of the World Trade Center and a conspiracy to destroy additional landmarks. He committed those crimes while he was an inmate in Attica state prison. Was he deterred, remorseful? Not a chance. A terrorist is not rendered harmless while in prison. He will act if he can. If he can't, he will influence. The jailed terrorist often provides a vehicle for others to be radicalized. What, then, should prosecutors seek in addition to the life sentence they recommend for Rahimi? Clearly special administrative measures must be put in place to restrict the time Rahimi is allowed out of his cell to interact with other inmates. Restrictions should also control who visits him, and whom he is allowed to communicate with on the telephone. In light of the case against Lynne Stewart, the attorney for "Blind Sheik" Omar Abdel Rahman who was convicted of facilitating "a communications network that enabled a convicted and imprisoned terrorist, Sheikh Omar Abdel Rahman, to perpetuate his position as the spiritual leader of his terrorist organization, the Islamic Group," these restrictions should also include Rahimi's legal counsel. These conditions are neither cruel and unusual punishment nor torture. These are effective methods used by prison administrators to prevent future criminal acts by incarcerated terrorists. 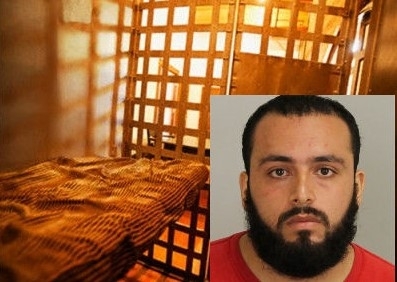 When we consider the fact that there is currently no effective de-radicalization prison program for Islamic terrorists in either the United States or the European Union, the outlook for Rahimi's rehabilitation while incarcerated does not look promising. We therefore urge U.S. District Judge Richard Berman to attach the most stringent conditions of confinement allowed under law to Rahimi's sentence. Prisons are not designed to be enjoyable and they certainly shouldn't become playgrounds for undeterred terrorists to ply their trade.